Just over 12.2 million individuals signed up for Obamacare coverage in 2017, roughly half of what the Congressional Budget Office projected four years ago. The Centers for Medicare and Medicaid Services released its final enrollment report on Wednesday, showing how many individuals signed up for Obamacare coverage between November 1, 2016 and January 31, 2017. The agency reported that 12,216,003 Americans either purchased a new Obamacare plan or were automatically reenrolled in Obamacare plans. Approximately 9 million Americans used Healthcare.gov to purchase insurance, while 3 million Americans bought coverage through the state-based marketplaces. These enrollment numbers are dramatically different than the CBO's forecasted enrollment numbers in 2013. The CBO predicted that 24 million people would purchase coverage on the exchanges in 2017, nearly double the most recent enrollment figures. "CBO has a poor record of predicting coverage," said Diana Furchtgott-Roth, a senior fellow at the Manhattan Institute. "In 2013, CBO predicted that 24 million people would be on the Obamacare exchanges, that law's health insurance marketplaces, in 2017." Most recently, the budget office scored the Republican's replacement plan to Obamacare, the American Health Care Act, and projected that 14 million Americans would become uninsured due to the legislation. 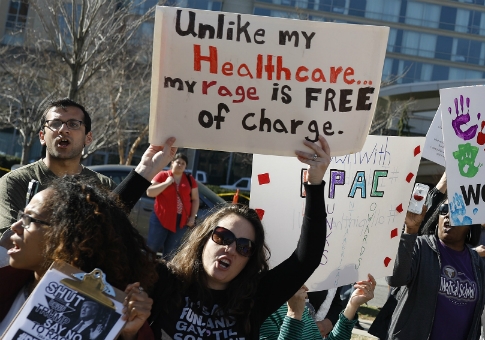 "They haven't really said why their forecast of Affordable Care Act [ACA] enrollment was wrong," Furchtgott-Roth said, using another name for Obamacare. "So that's why their forecast of the coverage for the Republican bill is so odd." "Here they are forecasting coverage, but they got it completely wrong under the ACA, because people didn't want to buy ACA coverage," she said. The enrollment numbers also show fewer Americans selected an Obamacare plan this year than last. In 2016, 12.7 million Americans signed up, while 12.2 million signed up in 2017. Federal health officials cited record signups leading up to the end of open enrollment, suggesting Americans would lose coverage under the new administration. "Federal health officials Wednesday touted a record 6.4 million customer sign-ups on the federal Obamacare marketplace HealthCare.gov so far this open enrollment season—topping last year's pace during the same time period by 400,000 customers," CNBC reported. "And they sharply warned that insurance coverage gains under Obamacare could be lost if President-elect Donald Trump and congressional Republicans follow through on their threats to repeal the Affordable Care Act."